How Long Can You Cook Beef Ribs at 300 Degrees? A plate of ribs alone doesn't make a balanced meal. 4 How Long Can You Cook Beef Ribs at 300 Degrees? 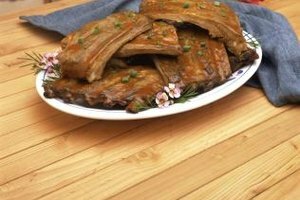 Barbecued ribs are most popular during the summer, when you can cook them outside on the grill. Cook ribs in the oven with barbecue sauce during other times of the year. A few simple sides served alongside the meat can round out the meal and provide a full dinner menu for your family. As the focal point of the dinner, you want enough ribs for everybody to get a good serving, but not so many that the meal is unbalanced. 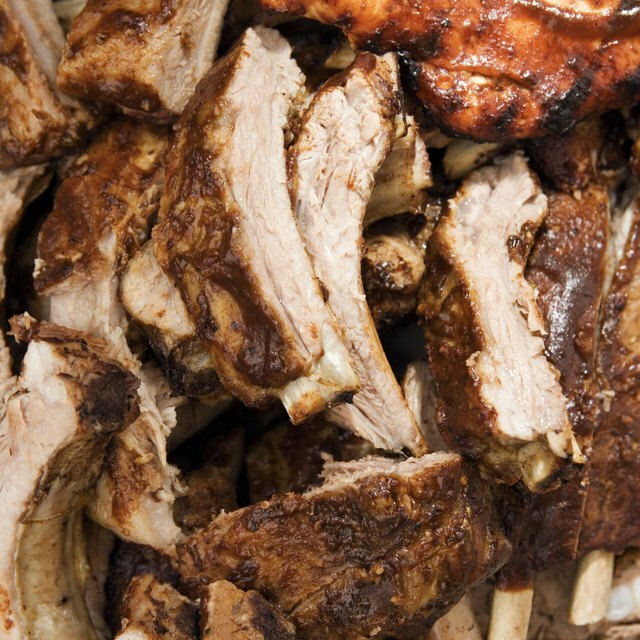 Plan on three to four ribs per adult, or one to two per child. If you are serving kids who might not appreciate eating meat off the bones, prepare some country-style boneless ribs for the younger folks. Marinate the ribs before cooking or use a dry rub, and don't add barbecue sauce until about 30 minutes before the ribs are done. Potato salad and pasta salad are staples of summer barbecues. Make them earlier in the day and refrigerate them until dinnertime. Mix cooked potato cubes or pasta pieces with cooked peas, chopped celery, minced red onion, chopped hard-boiled egg and other ingredients of your choice. Bring it together with your family's favorite light creamy dressing. When you heat up the grill, put some vegetables on alongside the meat for an easy side dish. If it is in season, corn on the cob makes an easy and inexpensive side. Other ideas include long strips of eggplant or summer squash; bell pepper halves;or sliced onions cooked on aluminum foil. If you can't choose, thread cubes of mixed vegetables onto skewers and grill those. When cooking indoors, frozen or canned corn with chopped bell peppers, onions and mushrooms make a colorful side dish. Or mix together shredded cabbage, carrots, pineapple chunks and a creamy dressing for a sweet coleslaw. Because barbecued ribs are such a heavy meal, opt for a light dessert to finish the dinner. Fruit is naturally sweetened and very versatile in desserts. Make fruit smoothies with mixed fruit and ice or fruit parfaits with mixed fruit spooned over yogurt. If you are feeling a little more adventurous, use store-bought pie crust and a muffin tin to make individual-sized fruit pies or tarts. If you used a grill for the ribs, clean it off and put slices of pineapple, peach halves or pear halves on to cook while you eat.